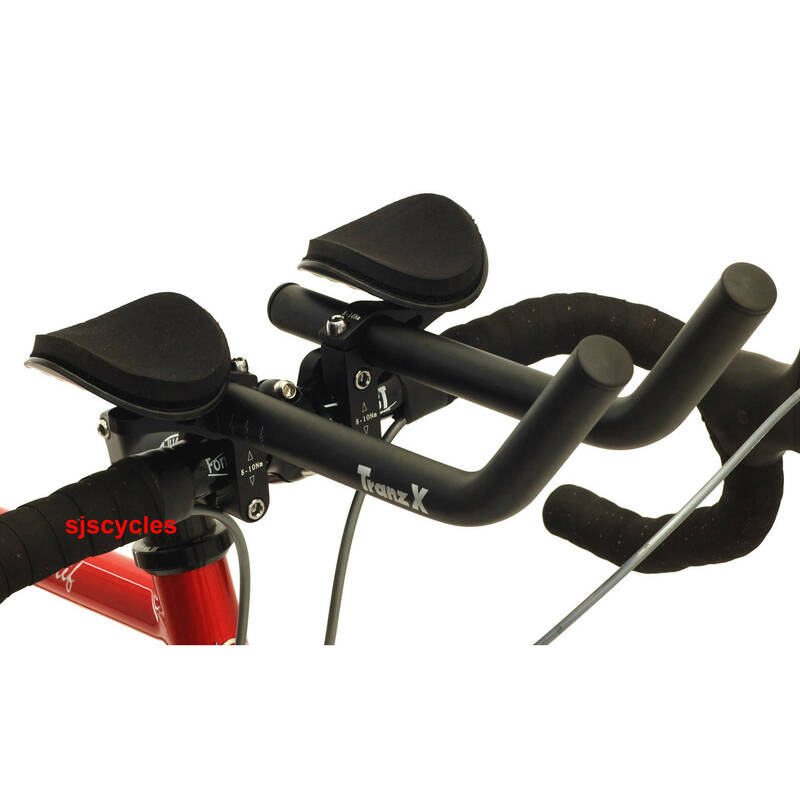 These are excellent entry level Aerobars, the clearance price is due to excess stock! Fully adjustable reach and width for a custom fit, these tri bars are excellent value for anyone wanting an aerodynamic riding position for triathlon or looking to equip an all weather training bike. 6061-T6 Alloy construction, they come supplied with shims to fit drop or straight handlebars of 31.8, 25.4 & 26.0mm diameter. They can be used with bar end gear shifters. Weight 460g including pads and shims. The clip on design makes them very easy to fit. Note: The drop handlebars shown in this image are not included. First pair of aero bars so didnt want to spend too much.arrived quickly and easy to fit.seem good quality for the money and would recommend. My 14 year old daughter fitted these unsupervised in 5 mins. Great quality, good range of adjustment. Fantastic price. When I followed her down our local long downhill she tucked in and pulled away ! Bought and fitted these to my road bike 2 weeks ago. Very easy to fit and adjust in any direction. Did a 22mile TT on Sunday and knocked 6 minutes off my pb! Great value with solid quality feel. I wasn't too sure what quality to expect at such a low price, however, I was very surprised at both the quality, and large range of calibrated adjustments offered, which was superb. After several different settings the "perfect" position was arrived at. the bars fitted the handlebars perfectly and the forearm pads are very comfortable. All in all an excellent product and very good delivery service by SJS. Incidental I bought my Coppi bike from SJS in 2001 and received the same excellent service. The bike is still in perfect condition and has never had any issues. Ive bought these bars previously from another supplier and when searching for them again I found them on this website. I found them to be an easy fit and fully adjustable to suit . Consnone, go buy a set! Was looking for cheap tri bars to try out with me only been a novice and come across these beauty's. They were value for money and even friends have ordered the same one's after seeing mine fitted, super super buy and will not change them now. Bought these for £25 and I have not been disappointed! these bars were lower than my old ones and lighter. I had trouble at first, with them moving when I put weight on them, I have a 25.4 handlebar, so you will need to put an extra shim on. As these fit an oversize bar (31.8) and have a shim for 26.0 bars. These aero bars are great for the price. They are good quality and fairly light. They are also comfortable and look great. Highly recommended! These bars are excellent value for money and 'do exactly what it says on the tin'. Quick and easy to fit and fully adjustable. Excellent speedy delivery by SJS. I absolutely love these bars, and aside from those made from carbon, I can't see why you'd need to spend more for aluminium bars! They are very east to set up and adjust, are quite comfortable even with my large forearms, and look good too. You do need to ride after after each adjustment to review your new set up, but I did it all in one go by bringing the allen key with me and stopping when something wasn't quite right. Now they're perfect! The pads are velcro and removable, so you can give them a clean. Need I say more? You won't be disappointed. Fully Adjustable Tri Bars For Less Than £25! ProsCost,easy to fit and well made. I put these onto my trekking bar and i thought i would have trouble,but no problem with these,cheapest and best value for money i saw on internet,easy to fit and velcro arm pads perfect. i always get a good service from sjs and will continue to shop with them. Long story short answer. I bought these to fit a straight handlebar Boardman Hybrid which I am using to do End 2 End in June 2011. I wanted something cheap which would allow me to get a few different positions on the bike during the long hours of riding. I am amazed at the quality of these bars for the price. Easy to fit lots of adjustment capability and look and feel very good quality. I am not disappointed and would strongly recommend these bars for any level of riding. Excellent value for money and fairly light too. Good solid clamps, pre greased threads. Fitted okay on tapered bars, just needed a couple of turns of bar tape for the clamps to sit on/bite into. Being adjustable you can remove bars and arm rests when not in use and just leave the clamp on ready. I was looking for some entry level tribars to fit to my road bike. I expected to pay £80+ for adjustable oneswhich was over my budget. I found these and thought they looked like a bargainand worth a gamble. So far I have not been disappointed. They arrived promptly and were of much better quality than expected for the price. Threads were even pre greased. So far they are exactly what i wanted but for a fraction of the price I'd expected to pay. These bars are excellent value for money. They're relatively light and easy to fit. Purchase was easy and delivery was prompt . Overall, very pleased with the product and the service. I a´m looking for TB02 handlebar . Do you have it in stock? What´s the price and package to Portugal? We do not currently stock these bars, but we are able to order them in on a special order for you. For more information regarding cost of both the item and the postage as well as the lead time please email ed@sjscycles.com.